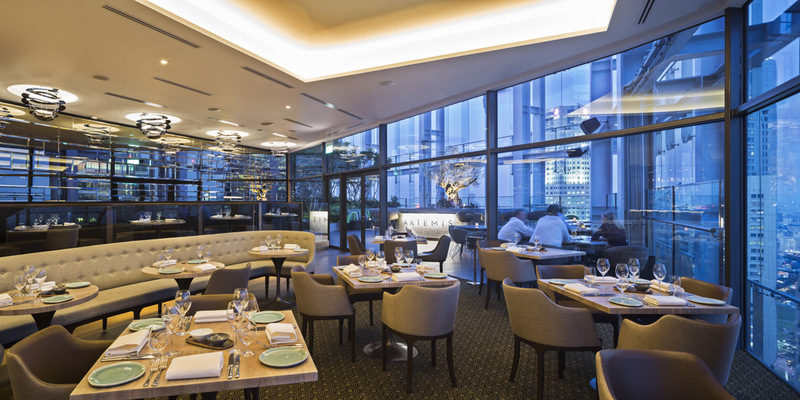 A cool, lighter-than-air feeling pervades CHIL’s design for Singapore’s Artemis Grill, where the skyline is a major component of the classic, modern Mediterranean-inspired design. It’s a time-honoured truth that travelling the world often has a profound effect on how you view home. It’s an interesting perspective from which to view the work of Vancouver’s CHIL Design. 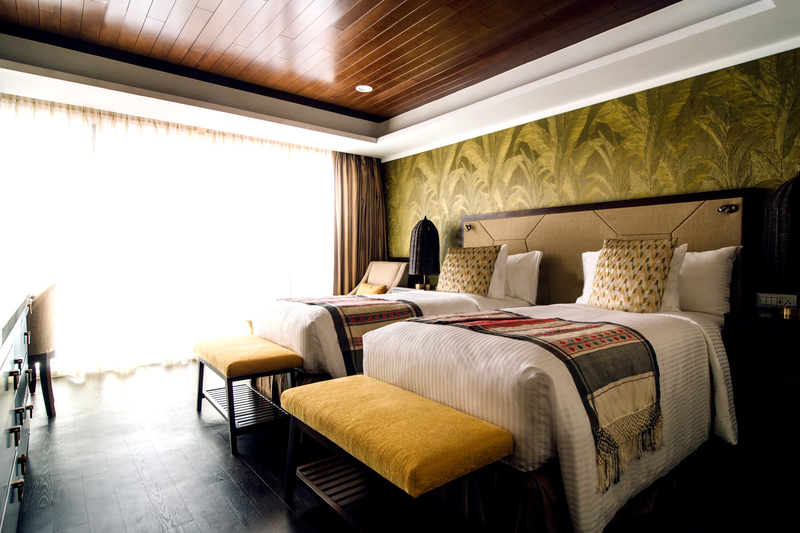 CHIL’s highly atmospheric interiors have earned an impressive array of awards over the years, including several in 2016; its greatest-hits list comprises most of North America’s top hotel chains such as Toronto’s tony Shangri-La Hotel, and increasingly, sought-after destinations all over Asia. Yet with a team of just 20 at its home studio in Vancouver —which recently expanded to about 37 after taking over parent company B+H Architects’ Hong Kong satellite in November last year — CHIL has a small-shop modesty that is quintessentially Canadian. According to co-principal Adele Rankin (who steers the firm along with Paul Morissette), the company’s penchant for immersing itself in the history and iconography of the host location, the client’s brand, and the often very specific expectations of future guests, are basic to its Canadian DNA. It’s not so much about an identifiable style or look, she explains, as a particular way of approaching a project — a certain tractability, perhaps. 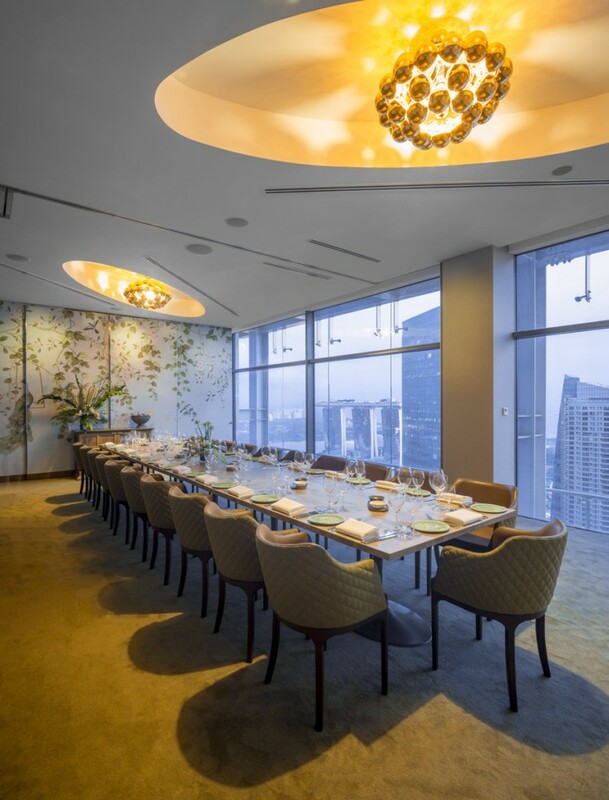 After Negrin’s death in 2010, CHIL was acquired by B+H Architects, whose own hospitality work had begun to reach into the fast-expanding Asian market, after opening a studio in Shanghai in the early ’90s. After being rebranded as CHIL Interior Design, it began to expand rapidly both in Canada and increasingly in the East. Whether working in Vancouver for marquee projects like the Fairmont Waterfront, or on any of several Far Eastern projects currently on their drafting tables, including Primus Sanya in China and Hong Kong’s new residential-style hotel, The Humphreys, CHIL’s small size gives it a nimbleness that more bureaucracy-heavy firms might not match. 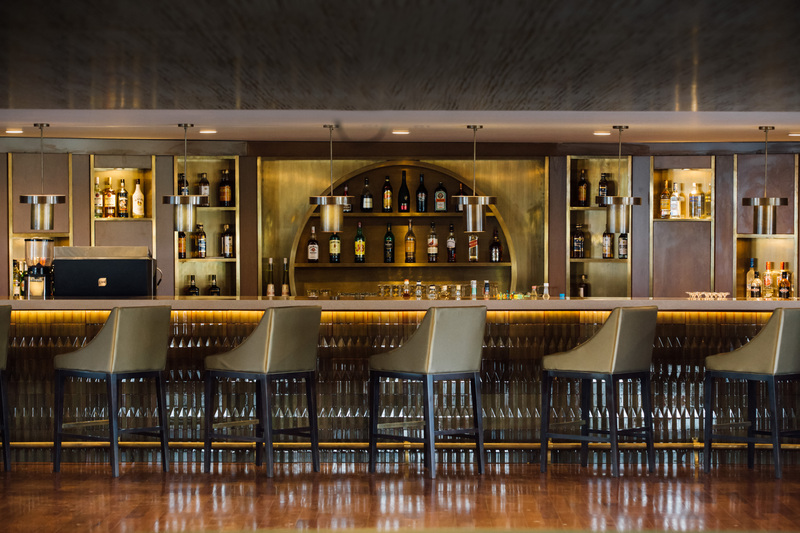 For example, the Waterfront may be part of a big chain, but CHIL’s design approach was as unique as if it were a boutique hotel, giving it a uniquely West Coast feeling with natural wood and stone elements, and floor-to-ceiling windows in every room that make the view the undisputed star. Myanmar’s storied textures of bronze, deep jungle greenery and precious jewels inspired the design of the RV Samatha riverboat lounge. In Asia, a rapidly expanding and increasingly affluent population has transformed the entire continent as a sought-after travel destination. “What’s attractive about designing there is that it gives you the opportunity to flex your design muscles,” says Rankin. “There’s a real value to the design process; it’s not as conservative as some North American cities, and the more the population travels, the more demanding they are in terms of expectations. But then, one of the most intriguing projects they’ve tackled in the last few years actually wasn’t a hotel at all: it was a pair of luxury riverboats in Myanmar, commissioned by an Australian touring company. The story of how they acquired the job is as non-standard as the projects themselves. 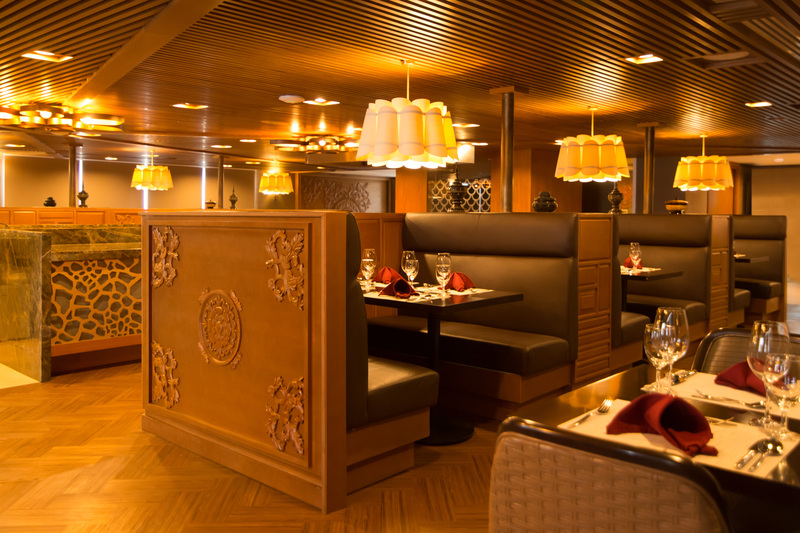 Traditional carving motifs crown the RV Samatha’s onboard restaurant, a co-partnership between tour operator Australian Touring Partnership and Luke Nguyen, Australia’s Jamie Oliver. 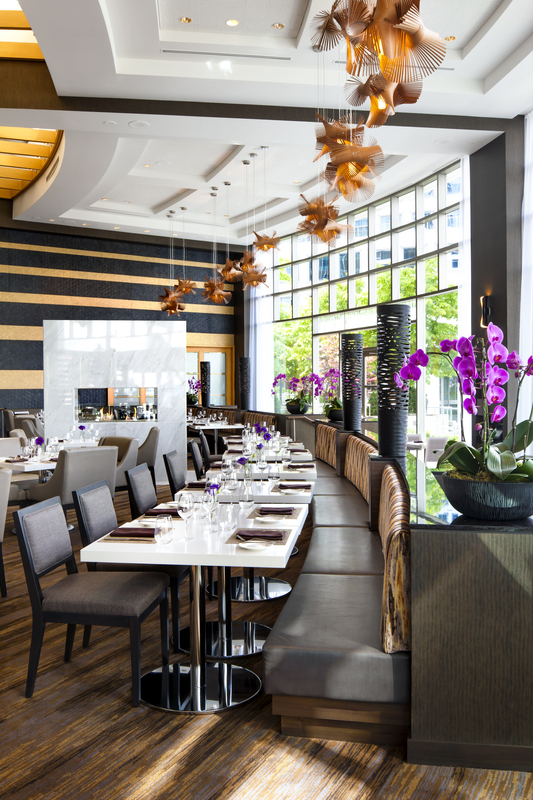 The Arc Restaurant at Vancouver’s Fairmont Waterfront is quintessentially western Canadian with its abundance of woods and natural light, perfectly complementing the seaside view beyond the curving windows. Light fixtures made from wood veneer strips, by the Spanish firm LZF, dance high above like a flock of fluttering seabirds. Rankin concludes that it’s hard to make blanket statements about what constitutes “Canadian design,” given the diversity of the country. But perhaps it’s exactly that diversity, and ease with other cultures, that international clients are tapping into. “Our approach is to celebrate the location, in a more low-key and collaborative way, rather than imposing our own Canadian style,” she says, Which, in itself, is a very Canadian way to do things.